While recent headlines continue to focus on Britain’s inability to agree an “orderly withdrawal”, it remains business as usual in Ireland, albeit with a nervous anticipation about what impact Brexit will bring. The following is an article from a recent edition of Ireland’s Hotel and Catering Review written by Mairea Doyle Balfe, a director of our dedicated Hotel, Tourism and Leisure team. 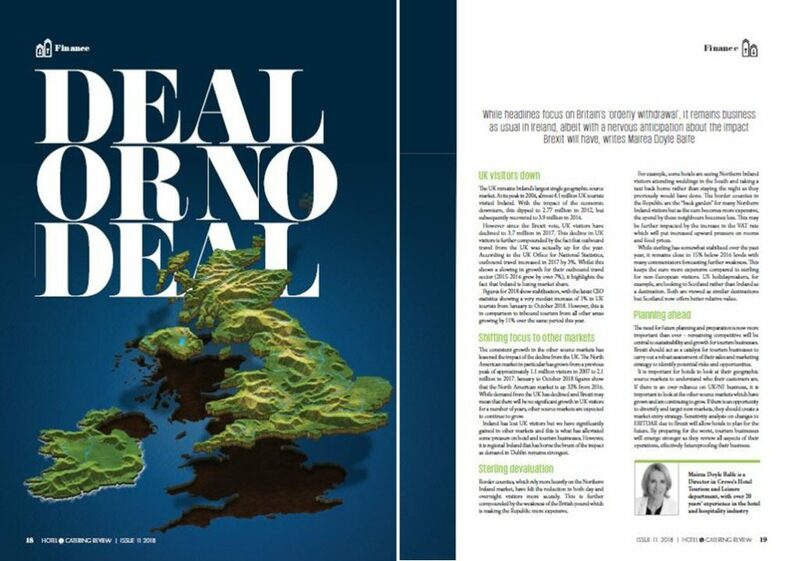 The UK remains Ireland’s largest single geographic source market. At its peak in 2006 almost 4.1m UK tourists visited Ireland. With the impact of the economic downturn this dipped to 2.77m in 2012, but subsequently recovered to 3.9m in 2016. However, since the Brexit vote UK visitors have declined to 3.7m in 2017. This decline in visitors from the UK over 2017 is further compounded by the fact that outbound travel from the UK was actually up for the year. According to the UK Office for National Statistics, outbound travel increased in 2017 by 3%. Whilst this shows a slowing in growth for their outbound travel sector (2015-2016 grew by over 7%), it highlights the fact that Ireland is losing market share. Figures for 2018 show stabilisation, with the latest CSO statistics showing a very modest increase of 1% in UK tourists January to October 2018. However, this is in comparison to inbound tourism from all other areas growing by 11% over the same period this year. The consistent growth in the other source markets has lessened the impact of the declines from the UK. The North American market in particular has grown from a previous peak of c. 1.1m visitors in 2007 to 2.1m in 2017. January to October 2018 figures show that the North American market is up 32% from 2016. While demand from the UK has declined and Brexit may mean that there will be no significant growth in UK visitors for a number of years, other source markets are expected to continue to grow. 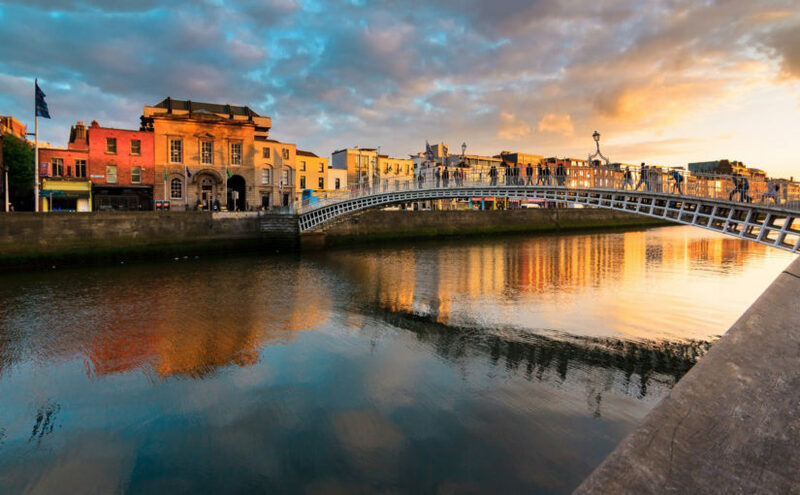 While Ireland has lost UK visitors, we have gained in other markets significantly and this is what has alleviated some pressure on hotel and tourism businesses. However, it is regional Ireland that has borne the brunt of the impact as demand in Dublin remains strongest. Border counties, which rely more heavily on the Northern Ireland market, have felt the reduction in both day and overnight visitors more acutely. This is further compounded by the weakness of the British Pound which is making the Republic more expensive. For example, some hotels are seeing Northern Ireland visitors attending weddings in the south take a taxi back home rather than stay the night as they would previously have done. The border counties in the Republic are the “back garden” for many Northern Ireland visitors, but as the euro becomes more expensive the spend by these neighbours becomes less. This may be further impacted by the increase in the VAT rate which will put increased upward pressure on rooms and food prices. While Sterling has somewhat stabilised over the last year, it remains close to 15% below 2016 levels with many commentators forecasting further weakness. This keeps the euro more expensive comparative to Sterling for non-European visitors. US holidaymakers, for example, are looking to Scotland rather than Ireland as a destination as both are viewed as similar destinations but now Scotland offers better relative value. The need for future planning and preparation is more important now than ever – remaining competitive will be central to sustainability and growth for tourism businesses. Brexit should act as a catalyst for tourism businesses to carry out a robust assessment of their sales and marketing strategy to identify potential risks and opportunities. It is important for hotels to look at their geographic source markets to understand who their customers are. If there is an over-reliance on UK/NI business, then it is important to look at the other source markets which have grown and are continuing to grow. If there is an opportunity to diversify and target new markets they should create a market entry strategy. In addition, sensitivity analysis on changes to EBITDAR due to Brexit will allow hotels to plan for the future. By preparing for the worst, tourism businesses will emerge stronger as they review all aspects of their operations, effectively future-proofing the business. Our specialist hotel tourism and leisure team can also provide support and guidance to help your business assess the current and potential impact of Brexit. We can help you uncover the opportunities and threats facing your business and help you develop a sales and marketing plan that will respond to the unfolding situation.